What do you do with coffee filters after you brew your coffee? Like most people you probably toss them in the trash. Well, now you can turn those oldcoffee filters into beautiful flowers. Just follow the steps below. After you brew your coffee put the coffee filter to dry. If you want dark brown color leave the coffee ground inside of it. After completely dry, clean the coffeefilter with a brush. Take all the grounds off. The flower can be with the coffee filter in its natural color or you can dye it with the color you like. Use water based paint mixed with water otherwise the coffee filter gets too hard. Either way use a coat of water based glue to seal the coffee filter. Your coffee filter is ready! Let’s get the canvas. Use a square shaped canvas to make a 12” x 12” flower. Put a coat of primer on the canvas then let it dry. Now you need to make a model of petals with 3 different sizes: 3”x3,” 2.5”x2.5,” and 1.7”x 2.” The measurement doesn’t need to be exact just cut the coffee filter in a shape of a petal. You will need more or less petals depending of the size of the flower you want to make. Use the scissor to curve both edges of the petal giving it a sense of movement. Now that you prepared the petals and the canvas you can start to make the heart of the flower. Fold the smaller petals one by one to make the center of the flower. Glue them in the center of the canvas. Add some more small petals around it. Put the glue just at the final part of the petals. Your flower now is getting the right shape. After the small petals are in place it is time to glue the medium sized ones around them. When you think you have enough medium petals start to glue the biggest ones. Step #5: Display and enjoy! Done! 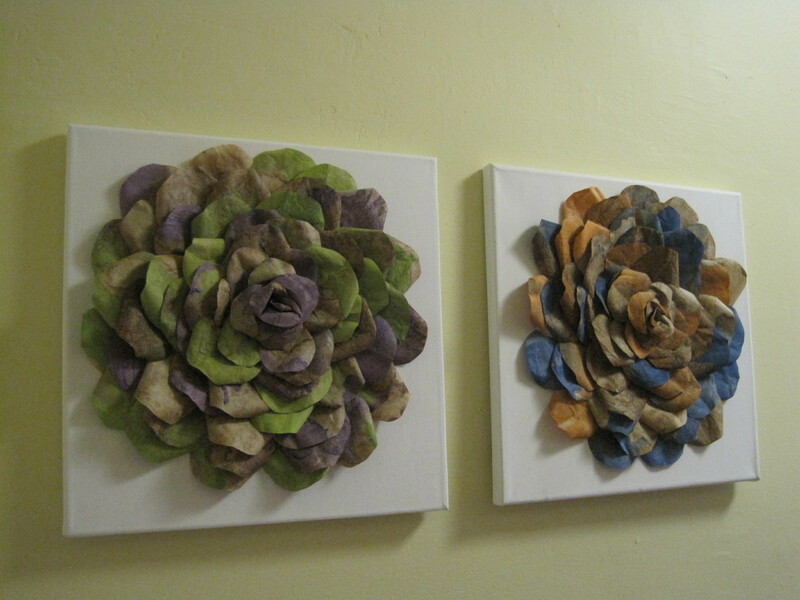 You have a beautiful and unique flower made with recycled coffee filters! I am the artisan behind Lampada. I handcraft lampshades and home decor with recycled coffee filters.